Beach days can be a blast when you bring along a canine pal or three, but taking a dog to the beach requires some preparation, know-how and a little common sense -- or should that be canine sense? Anything that can harm you at the beach can also harm your dog, such as sunburn, riptides, jellyfish, broken glass, sharp shells and aggressive dogs. But a beach day isn't supposed to be about doom and gloom. Having a great day is easy when you know how to prepare for and prevent any potential mishaps. 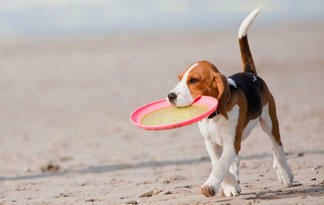 Read on for our best safety tips to help you and Fido find fun and relaxation together in the sun, surf and sand.